Rumors of Mr. Jingeling's demise have been greatly exaggerated. Certainly Earl Keyes, the most well-known actor who played Mr. Jingeling, passed away in 2000, but the character is alive and well thanks to a local company called Traditions Alive. I recently spoke with owner John Awarski, who started the company 15 years ago after sitting around and reminiscing with some friends about Cleveland history and the things that we've lost. Someone mentioned Mr. Jingeling, so Awarski, determined not to let the memory of this beloved character be forgotten, contacted Earl Keyes in order to get the record straight. "He made me sit at his feet while he magically transformed into Mr. Jingeling," Awarski said, when I asked him about his first meeting with Keyes. Keyes told him the story of how Mr. Jingeling came to be, and Awarski knew that he should not let the character die when Keyes did. So he put together a picture book called How Mr. Jingeling Saved Christmas, and found a new actor, Jonathan Wilhelm (pictured, with Santa) to play the part. Since then, he's made recession-friendly appearances at South Park Mall (you have to pay to get your picture taken with Santa, but pictures with Mr. Jingeling are free), and even conducts Mr. Jingeling's Holiday Express for the Cuyahoga Valley Scenic Railroad. You can check his schedule here. Why should people care about Mr. Jingeling? Mr. Awarski became passionate when I asked him this question. "Because there are so many people in Cleveland who aren't from Cleveland anymore," he said. 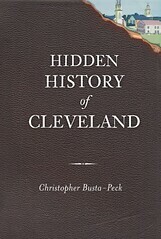 Our local culture, those little things that make Cleveland Cleveland, dissipate and die off when people move away. It's up to people like Mr. Awarski -- indeed, it's up to all of us -- to preserve them. That is a Great Post..Mr. Jingeling and those like him..traditions.. was what made Cleveland what it was..We're losing that nowadays.. Thank you! Cultural heritage preservation is my particular interest. There's a sort of homogenization at play in the US (and elsewhere, to be sure) - everyplace is becoming like everywhere else, and these little, local micro-cultures are disappearing. Mr. Jingeling may just seem like a fun, silly character, but I believe we've got to make an effort to make sure he's not forgotten because he's part of what made us who we are. This is wonderful! I still sing part of Mr. Jingeling's song at this time of year--"Mr. Jingeling, how you ring-a-ling, with your many keys. On Halle's seventh floor, we'll be looking for you to turn your keys." This brings back such warm memories for me. Mr. Jingeling, Barnaby, Woodrow, Captain Penny, and even Houlihan and Big Chuck will always have a warm place in my heart. By the way, I stumbled across your blog via a cooking blog! I'll be checking back often. I no longer live in Cleveland, and few people would understand my excitement over hearing news about Mr. Jingeling! Thanks! Hi Sandy- glad you could find us! It's Cleveland expats like yourself who are perhaps the most important to reach out to. I've been one myself, and I know what it's like to live someplace where no one else shares your cultural memory. Welcome!